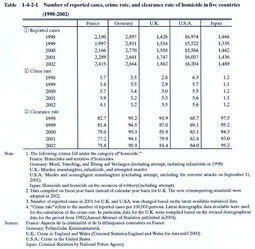 Table 1-4-2-1 shows the number of reported cases,crime rate,and clearance rate of homicide in five countries since1998(see Appendix1-14 and 1-15 ). Although there are some discrepancies in the constituent elements of homicide in those countries,when only the statistics under this charge are examined,both the number of reported cases and crime rate of homicide in Japan have been the lowest among the five countries,except for reported cases in the U.K.in1998. On the other hand,the clearance rate in Japan maintained a high level of over90%along with that in Germany.Among other three countries,the clearance rate was highest in U.K.,followed by France and U.S.A.throughout the period.